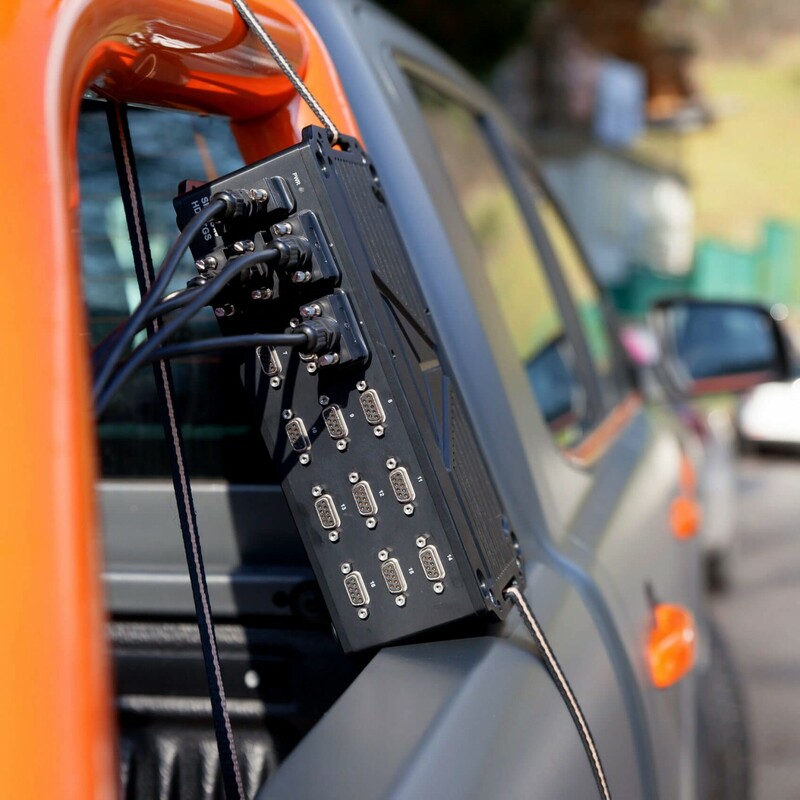 Extremely rugged, IP67 rated, fast and highly precise, mobile and distributed data acquisition system for testing in harsh environments. With USB and EtherCAT data interface. IP67 DEGREE OF PROTECTION: SIRIUS waterproof is designed for testing in extremely harsh environments. The unit is waterproof, dustproof and can withstand shocks up to 100G. -40 to 60 °C: Extreme testing means extreme temperatures. SIRIUS waterproof is ready. UNIVERSAL ANALOG INPUTS: Universal analog amplifiers can accept voltage and full/half/quarter bridge signals natively as well as IEPE, charge, thermocouples, RTD, current, resistance and LVDT signals with the use of DSI adapters. 160 dB DYNAMIC RANGE: With our DualCoreADC® technology all analog inputs boost dual 24-bit delta-sigma with an anti-aliasing filter, achieving astonishing 160 dB dynamic range in time and frequency domain with 200 kHz sampling rate per channel. HIGH ISOLATION: High channel-to-channel and channel-to-ground isolation prevents damage to the systems from excessive voltage and avoids ground loops. DIGITAL/COUNTER/ENCODER INPUTS: Each channel is capable of 3x digital inputs, 1x event counter, encoder, period, pulse-width, duty-cycle. Precise frequency and angle measurement uses patented SUPERCOUNTER® technology. SENSOR POWER SUPPLY: Each channel provides power for sensor excitation. FULLY SYNCHRONIZED: Each channel, either analog, digital or CAN is synchronized with microsecond accuracy. SOFTWARE INCLUDED WITH FREE LIFETIME UPGRADES: Easy to use, yet very robust in functionality, award winning DEWESoft X3 software is included. Software comes with lifetime free upgrades and no hidden costs, bringing you intuitive configuration, smart sensors, advanced storage and analysis capabilities. For testing in harsh environments equipment needs to withstand extreme conditions like cold, dust, mud, and rain. SIRIUS waterproof is ultra rugged DAQ instrument with IP67 degree of protection. DAQ system is not just extremely reliable, but also precise, and protected from water, humidity, dust, shock, vibration up to 100G and can work in -40 to +60 °C. 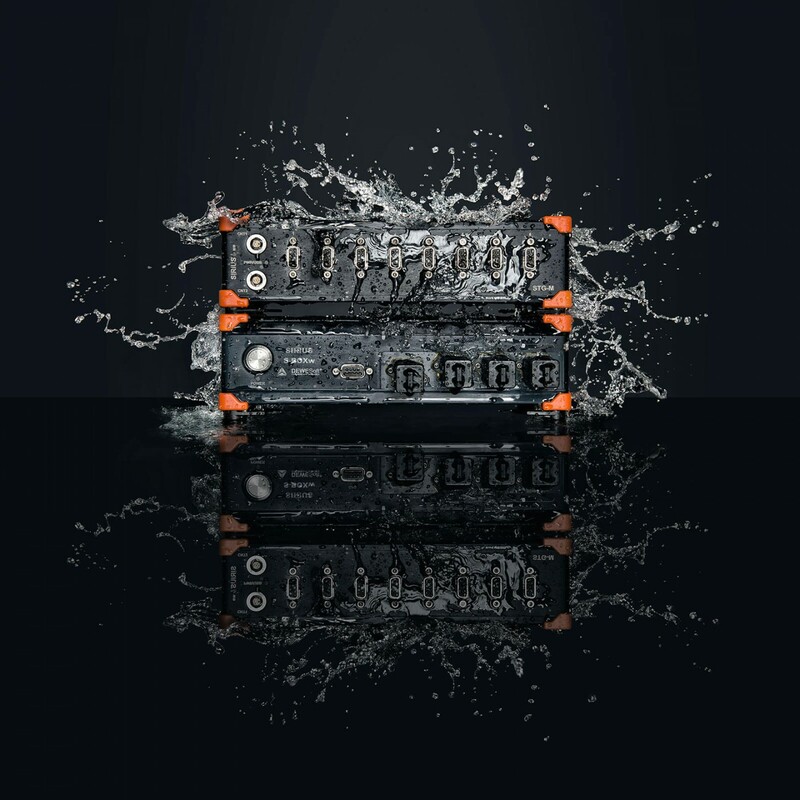 SIRIUS waterproof is build around the same world leading SIRIUS DAQ technology. 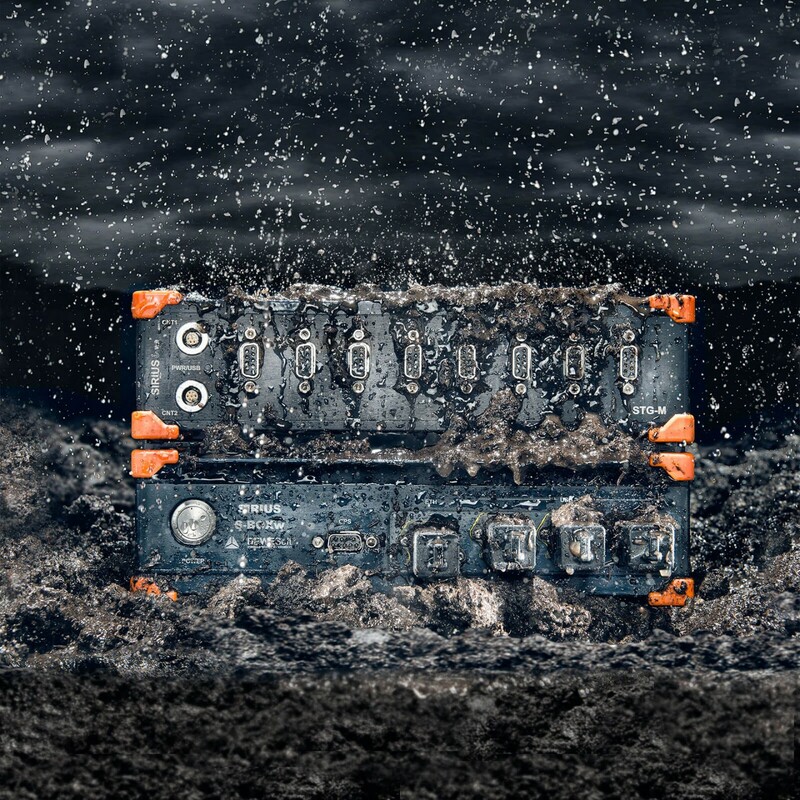 Each SIRIUS waterproof slice can hold up to 8 universal 24-bit analog inputs equipped with DualCoreADC® technology achieving 160 dB dynamic range and acquisition speeds of 200 kHz per channel. 16 channel version with 24-bit universal analog inputs with acquisition rate of 200 kHz per channel is also available. SIRIUS waterproof can also be configured with counter/encoder and digital inputs equiped with our patended SuperCounter® technology. This will allow for precise measurement of frequency, RPM, and angle. To learn more about SuperCounter® technology visit SIRIUS DAQ system page. SIRIUS waterproof slices are equipped with USB and EtherCAT interface. Use USB data connection for fast data speeds up to 200 kHz per channel. If you want to distribute the units closer to the sensors and over large area then you can daisy-chain units together with single EtherCAT cable. This single cable will be used for power, data, and syncronization for all units. The distance between units can be up to 100 meters (320 feet). 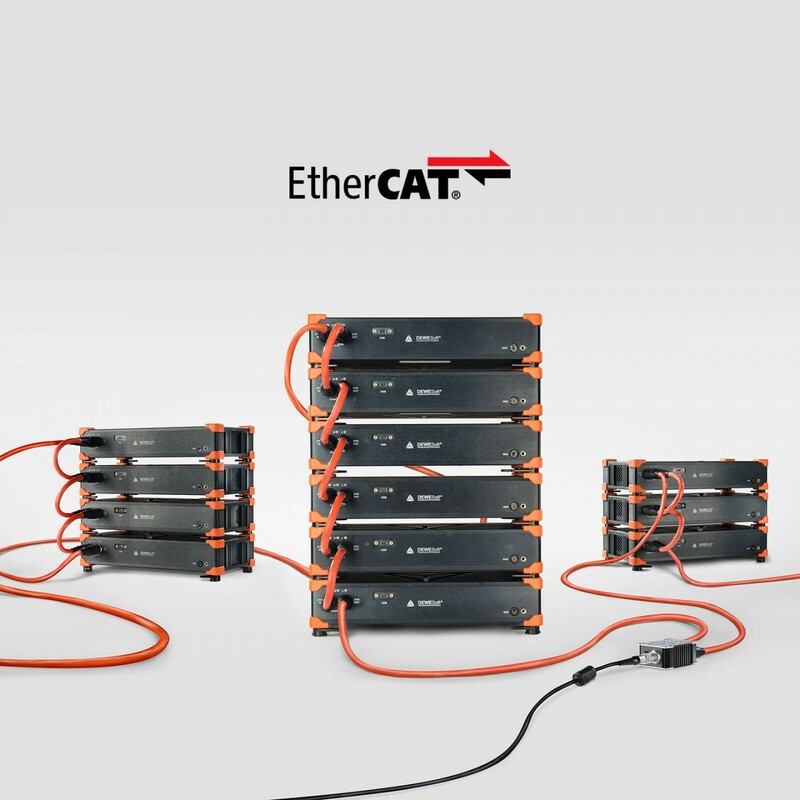 Using EtherCAT for connection you will not only spare money on sensor cabling but also vastly improve signal quality. SIRIUSiwe-6xSTGM-2xSTGM+ with 8 isolated universal & strain analog channels and two counter channels. SIRIUSiwe-6xLV-2xLV+ with 8 isolated universal analog channels and two counter channels. SIRIUSwe-HD-16xSTGS with 16 differential universal strain analog channel and two counter channels. All universal analog inputs can be extended with our smart Dewesoft Sensor Interface adapters (DSI) which will transform any analog input into direct IEPE, Charge, Thermocouple, LVDT, RTD or current input. All inputs are equiped with advanced TEDS functionality for automatic sensor detection and plug and play configuration. Multiple SIRIUS waterproof data acquisition units can be stacked and syncronized together to expand the channel count. 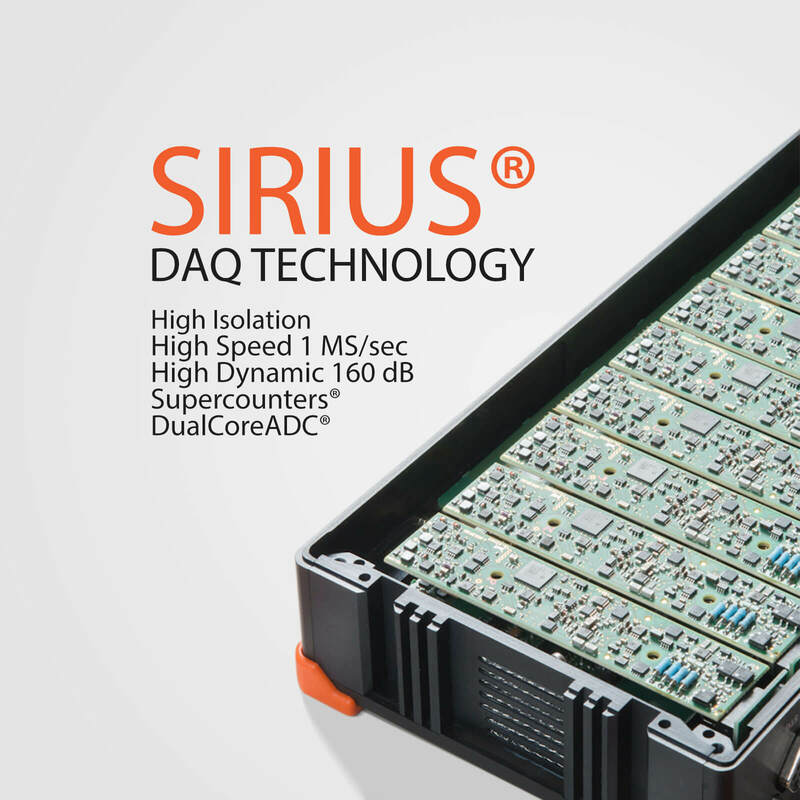 SIRIUS waterproof is also compatible and can be extended with our ultra rugged KRYPTON DAQ modules or standard SIRIUS DAQ slices in the same EtherCAT line. Working with multiple units is as simple as working with one unit. Software will simply recognize all the available channels and you are ready to go. What is the point of having ultra rugged DAQ system if you don't have ultra rugged data logger and powerful data processing computer to go along with? Look no further then SBOX waterproof! SBOX waterproof was designed to work hand in hand with SIRIUS waterproof. It will add powerful SSD data logging and realtime data processing capabilities with the same ultra ruggedness and IP67 degree of protection. Visit SBOX waterproof product page for detailed information.